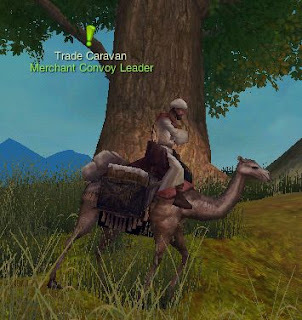 The Merchant Caravan spawns in the Land of Scavengers on the west side of the map. From there he travels an "S" route going north before heading south through the middle of the map turning back north along the road just southeast of Bramble Camp. He then goes up the road towards Welkin Castle and despawns once he reaches Labis Starsign (the Welkin Castle entrance NPC). 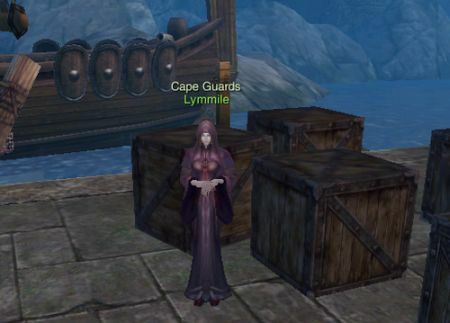 Choosing to help the caravan will give you one of several random quests and help you along your way to completing the "Wonderful Encounter - Journey of Mystery" achievement. - Pitch a Tent - Pitch a tent in Lunagrant. Robbing the caravan is the easiest quest to accomplish but is also the least rewarding. You get some odd number of soul coins (less than 1 sg at level 80) for your troubles. Threatening the Merchant Caravan will cause him to spawn 2 or 3 guards (level 50ish if I remember correctly) that will attack you. If you defeat them, the Merchant Caravan will pay you soul gold to spare him (and no, you can't kill him). This option gives you a little more soul gold than robbing him (a little more around 1.5 sg at level 80). *Eat Tomato for "Glutton" title. To Tuka for "Greedy" title. To Lymmile for "Deceiver" title.